Inspired by AndThen’s recent post about his family history, I thought I’d write a bit about my own. My family history is quite colourful. My great-great-great-great-grandfather was some kind of representative for Germany in a trade dispute in Cape Town, South Africa. His name was Maximilian Thalwitzer and he was born in Germany but later emigrated to Cape Town. The picture below is supposed to be of him. I don’t know all that much m ore about him except that he was declared insolvent in 1855. One of his children, Diedrich Pallas Thaliwtzer, moved to Australia in 1852 on the steamer Phoenix. Family rumour has it that Diedrich was racist and didn’t like the blacks in South Africa, hence the move. He was a bit of a prick anyway because he disowned his daughter, Maria, my great-great-grandmother, when she married because he felt she married beneath her. Which brings me to the convict. Maria married the descendant of a convict – someone called Michael Burns who was sentenced in Lancaster, England and arrived in Australia in 1828 aboard the Marquis of Hastings. He was pardoned five years later and went on to do quite well for himself. While he was a convict though, he helped to build the Old Great North Road in New South Wales. According to his Certificate of Freedom – of which I have a copy – his crime was stealing jewellery. Maria and her husband only had one child – Charles Dudley Pallas Thalwitzer Burnes – my great-grandfather. He was a very successful patent attorney in Sydney who was adored by all his grandchildren. He loved kids, was very generous, and quite eccentric. My aunt told me that he once employed a secretary simply because her name was Petsy Pert. He was wealthy and one of the first people to own a car in his area. I think this says something about Australia and how wonderfully classless it was when you can go from convict to successful patent attorney in just three generations. When given the opportunity, people can thrive. My grandfather on the other side of the family – Henry “Harry” Shelton – had a farm in South East Queensland which he inherited from his father. Henry was the brother of William Haswell Shelton who died at the shoreline of Gallipoli. This didn’t put my own grandfather off joining the forces in WWII and fighting for his country, which he did, in the jungles of Papua New Guinea. He survived. Henry’s father was also called Henry Shelton and his father another Henry Shelton. There are lots of Henry Sheltons in that side of the familiy. 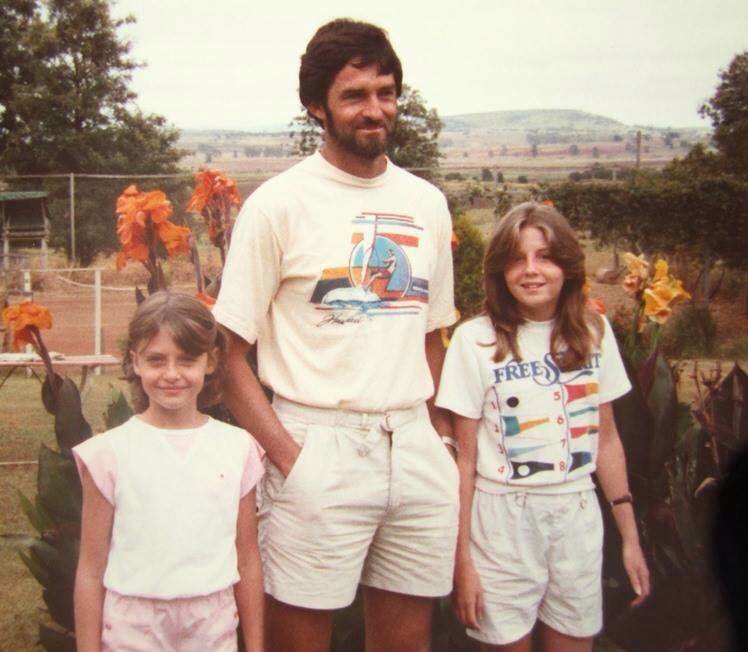 Here’s a pic of me (on the left) with my Dad and sister at my Grandfather’s farm in South East Queensland, taken many years ago. I also have ancestors from Wales, Ireland, and Scotland. Posted in Journal, Photos and tagged ancestors, ancestry, Australia, family history, Gallipoli. Bookmark the permalink. Interesting. I mentioned in my post that two of my ancestors involved in World War I were brothers, one Navy and one Army. One was killed in an air raid on Chatham Barracks in 1917 and the other survived the war. After they’d signed up they didn’t see each other until, during the Gallipoli landings, the brother in the army realised that one of the rowers rowing him to shore was his brother. I don’t know if they met again after that. That’s really quite remarkable. How could they not have seen each other on their ship? Presumably they were on the same one. Remarkable too, that they survived when so many did not. I signed up for ancestry.com about a year ago when they were offering a month of free access. I got a heap of information then, much more than I’ve included in this post. Now I use MyHeritage but I haven’t done any research for a little while. However I had to say that the sort of information you find at those places is not the stuff I find most interesting. I like to know a bit about the people themselves and what they were like, whether they had happy marriages and so on. This information is very hard to find. I’d like to find out more about my convict ancestor. His Certificate of Freedom says he was sentenced to Australia when he was only 21. It describes his appearance a little too, including a scar he had on the back of his left hand. What’s in store for your habitat?